Yi Guan - MD, PhD, M.S. Dr. Yi Guan has a strong background in microbiology and virology focusing on emerging infectious diseases. Currently, Dr. Yi Guan is a senior scientist in the Institute of Infection and Immunity in Shantou, China. As well he holds a position of senior scientist in the Department of Microbiology at The University of Hong Kong, China. Dr. Yi Guan is a full member of both the American Society of Virology and the American Society of Microbiology. 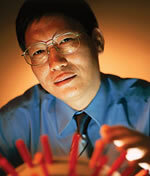 He was also a member of the bio-safety committee of China National Accreditation Board for Laboratories for 2005. The work of Dr. Yi Guan's lab has been highly influential in the identification of viral sinks, viral transmission and the characterization of emerging infectious disease evolution for diseases such as SARS and influenza. His findings have captured the attention of highly reputable media sources such as TIME magazine and CNN. His work on H5N1 has given a global insight into this influenza strain. Dr. Yi Guan's lab has sequenced the genetic code of more than 250 strains of H5N1, allowing the lab and other researchers to create a model of virus mutation and geographical distribution. As well, Dr. Yi Guan has made imperative discoveries in SARS research. Importantly, he has identified the source of SARS viral transmission from animals to humans to be the sales of civets in wild animal markets where humans were contracting the deleterious disease. Subsequent to his discovery, Dr. Yi Guan instructed the authorities to ban the sales of civets at wild animal markets thereby curbing further SARS out-breaks in China. The aim of Dr. Yi Guan's research is the prevention of a pandemic from zoonotic diseases.